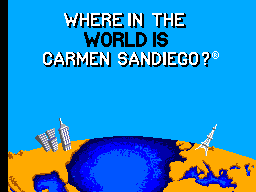 Sega8bit.com - Review: Where in the World is Carmen Sandiego? Review: Where in the World is Carmen Sandiego? Full Title: Where in the World is Carmen Sandiego? Everyone's favourite trivial pursuit game, Carmen Sandiego finally made her debut in SMS! For more than 20 years, ACME detectives are following the elusive thief Carmen Sandiego around the world using their wits and knowledge. And our red-clad mystery woman is now inside our SMS with hunderds of clues to follow, dozens of places to visit and of course, many heists to recover. As a detective of ACME Detective Agency, you must track down Carmen and her V.I.L.E. henchmen around the world and recover the treasures they stole. 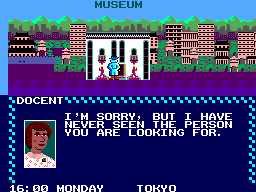 If you ever played a Carmen Sandiego game, you should be familiar with the routine. Something gets stolen, you are sent to the crime scene, you collect clues, listen witnesses, try to get the information together and find out where the thief gone. When you arrive the next location, you do these routines over until you reach him/her. Meanwhile you will prepare a warrant of arrest based on the clues given to you: eye and hair color, favourite food, distinctive feautres and the car he/she uses. When you finally reach him, you will enter a brief firefight and then you will be able to arrest him, if you got the warrant of arrest for the right guy. For the most part, you geographic and trivial knowledge about the countries, your observation skills and memory will be the things you will need. Time is in short supply however, you cannot waste your time wander around the world like a tourist. Think about your clues carefully and try to decide the next move of the thief. Keep in mind that you must also sleep every day about 7 hours or so. Pretty good for a 1988 game. Famous landmarks are faithfully depicted. For example you can see a colorful St.Basil's Cathedral when you go to Moscow. Character portraits are nice compared to other games released during the same period. Then again, you won't need to check any more graphics other than the backgrounds, since you will be busy piecing together the information you gathered. Well, except the music you hear in the title, there's no music to listen. Sound effects are abyssmal at best. But as I explained before, you shouldn't except too much from a trivial pursuit game when it comes to the music or sounds. There is no much to do expect move around the city, enter buildings and selecting things from the menus you come across. One important thing you should know, as you get closer to the suspect, V.I.L.E. thugs will attack you. If you get hit, you will lose prescious 2 hours. And when you reach the target, you must evade his attacks by moving up and down until police comes. This part is especially annoying in a trivial pursuit game like this. Different case, different places, different suspects everytime you play the game. If this is not a solid replay element, I don't know what is. I couldn't play this game when I fist got my SMS. I was in 5th grade and I did now a jack about english. And now, 15 years later, I'm blazing through the cases. Guess I'm not as stupid as I think. 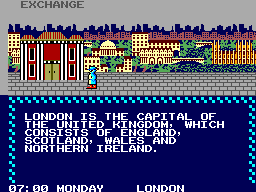 If you value your english, your trivial and geographic knowledge, this game will make you hooked on for hours. It is much more fun if you play it with a friend. Oh Carmen, we all missed you so much. Just give us a sequel already. Please.